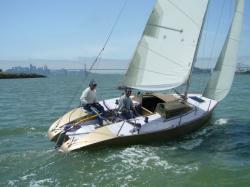 Additional Information: Now based in San Francisco this boat is a one off by Laurie Davidson, built for him by Newzie builders of Auckland, New Zealand in 1975. It appears to be cold moulded of oakume or meranti plywood over New Zealand pine. Fastened with copper ring shank nails and glued with resourcenol. The L.W.L. is 22' 6" the L. O.A. is 26' 6" , Displ. is 3, 400 lbs. Keel weight. is 1350 lbs. Max beam 8' 2" Sail area upwind approx. 350 sq. ft. Spinnaker, 500 sq. ft. Draft is 5' 6", Mast height 31' 6". boom length,11' 8". The boat originally had bricks of lead in the bilge and a centerboard, with a keel stepped alum. mast. In its present configuration it has a carbon fiber I.M.S. type retractable keel, with a carbon removable rudder and a deck stepped carbon mast. There has been a small 12 hp. saildrive installed with a folding prop.